The big screen overlooks Daryl Hall and John Oates on July 10, 2016, at the BB&T Pavilion in Camden, N.J.
Daryl Hall and John Oates are very good in concert. But when they go off the script a little, they’re even better. 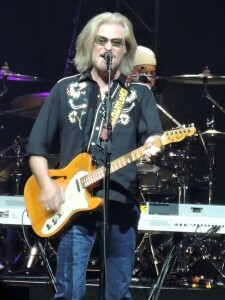 That’s what happened at the July 10 show at the BB&T Pavilion in Camden, N.J. Even though the venue is across the Delaware River from Philadelphia, this was clearly a Philly show with a Philly vibe by the Philly area natives. And the evening featured a couple of really cool surprises for the Philly faithful, which Hall promised at the beginning of the show. 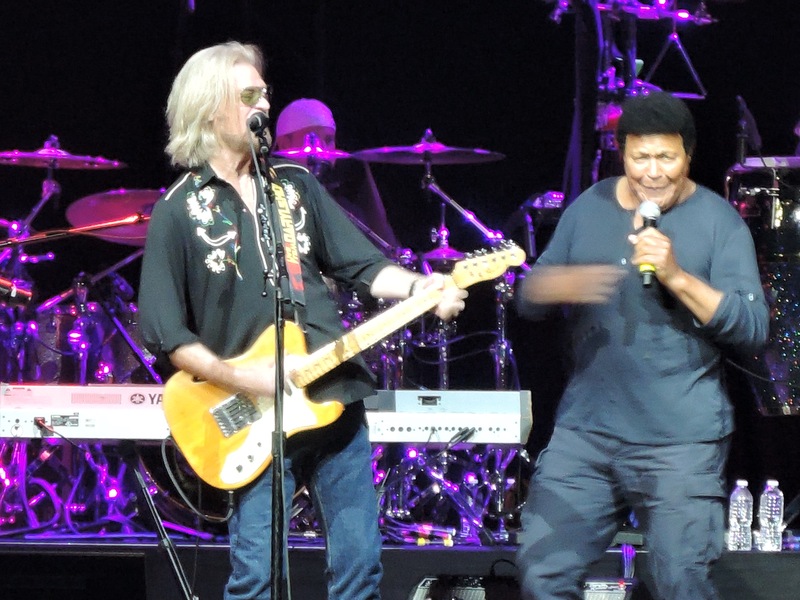 We know a Hall & Oates concert will include all the hits. And the setlist reflected that. H&O opened with “Maneater,” a No. 1 single in 1982, I think mostly to just get it out of the way. Although it’s a hugely popular song with the fans and gets everybody up on their feet right from the get-go, Oates is on the record in past interviews with me that he thinks he and Daryl – both members of the Songwriters Hall of Fame – have matured as songwriters since they wrote that tune. “Out of Touch” – No. 1 in 1984. “Say It Isn’t So” – No. 2 in 1983. “You’ve Lost That Lovin’ Feelin’” – A Righteous Brothers cover that was No. 12 for Hall & Oates in 1980. 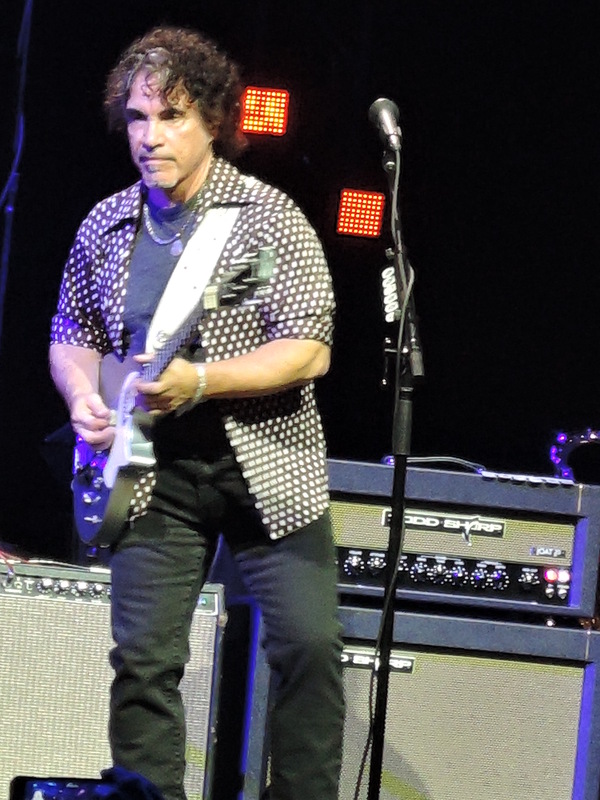 “Las Vegas Turnaround” – Not released as a single, but an Oates-penned song and fan favorite off the “Abandoned Luncheonette” album in 1973. “She’s Gone” – No. 60 when first released as a single off “Abandoned Luncheonette,” but No. 7 when it was re-released in 1976. “Sara Smile” – No. 4 in 1976. “Wait for Me” – No. 18 in 1979. “I Can’t Go for That (No Can Do)” – No. 1 in 1981. “Rich Girl” – No. 1 in 1977. “You Make My Dreams” – No. 5 in 1981. The first encore included “Kiss on My List” and “Private Eyes,” both No. 1 singles in 1981. But it was the second encore where the duo put everyone in a Philly mood. The 74-year-old Checker was raised in Philadelphia and had a smash single in 1960 with “The Twist,” which also turned into a dance style, one which I think I’ve done at every wedding I’ve ever attended. 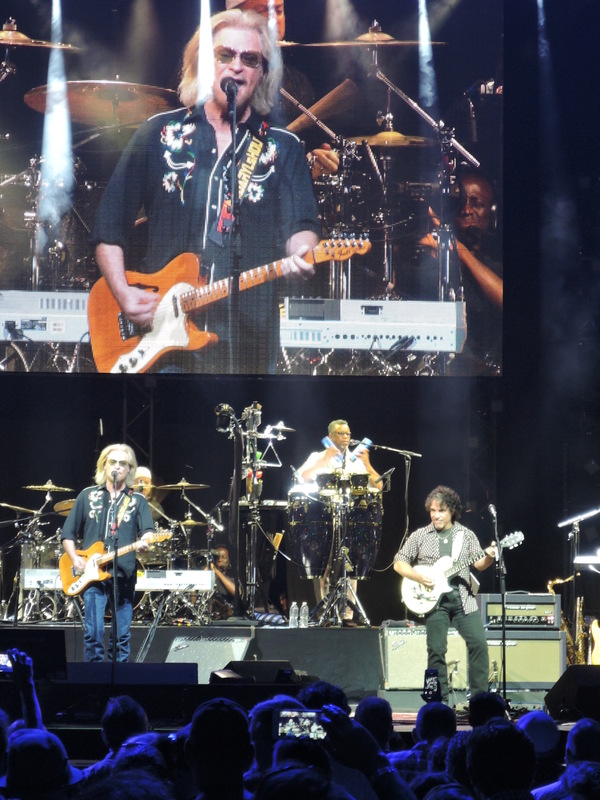 Hall, Oates and their always-stellar band then opened the second encore with “The Twist” while Chubby and the rest of us twisted the night away like nobody was watching. Fortunately, I did not pull a hamstring or blow out a knee. As much of a treat as it was to see Chubby, it was the second song of the second encore – and final song of the show – that sealed the Philly evening: A cover of “Didn’t I (Blow Your Mind This Time),” a 1969 single by the Philadelphia group the Delfonics, produced by Thom Bell and released on the Philly Groove Records label. The song predates the creation of Philadelphia International Records, founded in 1971 by Kenny Gamble and Leon Huff, and is recognized as one of the early “Philly soul” singles. Gamble and Huff would further develop and popularize the sound of Philadelphia – with a huge contribution by Bell who had eventually joined them – throughout the 1970s. It was the first time I had heard them do that song in concert, and really, I think it should be included in every Hall & Oates concert. It was just that good. The outdoor BB&T Pavilion was filled to capacity, with people seated on the lawn all the way up to the back wall, which is quite a long way from the stage. The weather cooperated for those exposed to the elements, which is something I suppose. But I prefer to stay a little closer to the action on the stage. Joining Hall & Oates on this tour and adding to the soul quotient was Trombone Shorty & Orleans Avenue and Sharon Jones and the Dap-Kings. Both were well-received by the Camden/Philly crowd and rightfully so. Trombone Shorty and his band are high energy and incredibly talented. And although Ms. Jones is battling a reoccurrence of pancreatic cancer that she thought she had beaten a few years ago, she showed tremendous heart and soul with her performance. “No matter how bad I feel, I just have to get on this stage. And I’m gonna give it all I’ve got.” The crowd recognized, respected and appreciated that effort. Editor’s note: Interviews with Daryl and John about the music on and the making of the 1975 album “Daryl Hall & John Oates” – known as “The Silver Album” – will be featured in “The Vinyl Dialogues Volume III: Stacks of Wax,” due out this month. They reveal what song on that album almost became the theme song for what would become a mega movie of the 1970s; the stories behind the singles “Sara Smile” and “Camellia”; and the details surrounding the photo shoot and decision to use a “glam rock” photo of the two on the cover. what a gracious, class act..Daryl’s heart is always in the right place..Gorgeous inside and out..I watched an episode of LFDH recenty with one of the young artists and Daryl commented that he wrote a song with Chubby Checker..I could see and feel the pride in him at that very comment!